Agriculture and agribusiness – i.e. food, fiber, and forestry – contributed nearly 17 percent (over $87 billion) to North Carolina’s total economic output in 2016, and employed 730,000 of North Carolina’s workers, according to a recent report from NC State. North Carolina is particularly known for two agricultural exports that will surely appear on many tables this Thanksgiving – turkey and sweet potatoes. North Carolina’s rank in sweet potato production among all 50 states, according to 2017 data from the USDA Agricultural Statistics Service. It has maintained this ranking for the last 18 years. 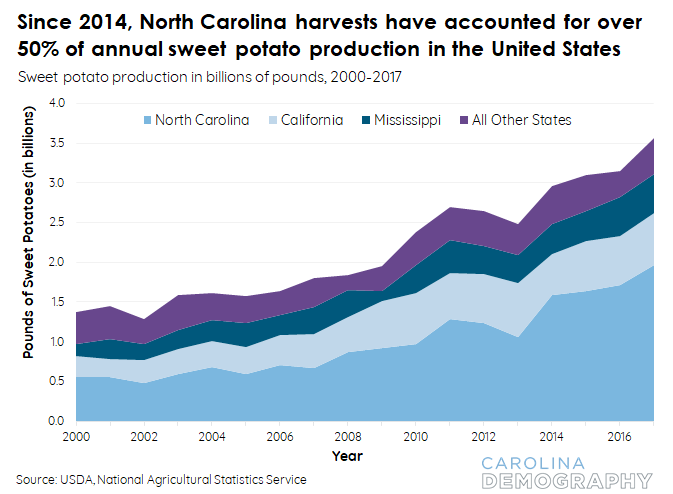 Pounds of sweet potatoes that North Carolina produced in 2017, exceeding all other states combined. Since 2014, North Carolina has annually broken its record for pounds produced, and this past year was no exception! It remains to be seen whether the 2018 harvest will continue this trend, however, as the impacts of Hurricane Florence and tropical storm Michael are still being measured. 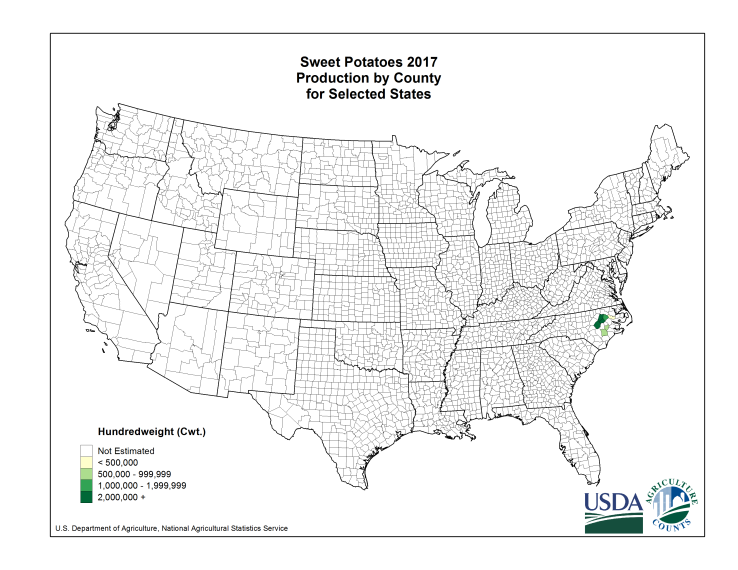 North Carolina’s share of national sweet potato production. North Carolina has accounted for over half of the nation’s total sweet potatoes since 2014. Value of the 2017 sweet potato harvest. Sweet potatoes were the fourth most valuable crop in North Carolina, behind tobacco ($724 million), soybeans ($639 million), and corn ($501 million). Wilson County alone produced more sweet potatoes in 2017 than the entire state of Louisiana (219 million pounds), the fourth-highest producing state. This entry was posted in Carolina Demographics. Bookmark the permalink.